The Star Wars community has been through quite the rollercoaster over the last year. It first started when Solo: A Star Wars Story ran into on set, mid-production issues that had the fandom everywhere pulling their hair out. Then there was The Last Jedi. While the film smashes records and brought something completely unique to the galaxy, it divided fans across the world. With Solo being released just 6 months after Rian Johnson’s film, that meant the second ever Star Wars spinoff had a mighty big hill to climb. Not only did the Han Solo spinoff have to prove that it was even close to being worthy of telling the origin story of our favorite smuggler and allow fans to accept the fact that someone else other than Harrison Ford can play the role, but it had to bring together the greatest group of fans film has ever seen. It needed to be the spark that brought everyone back to understanding why we love this franchise, and I’m very happy to say it accomplished that and then some. 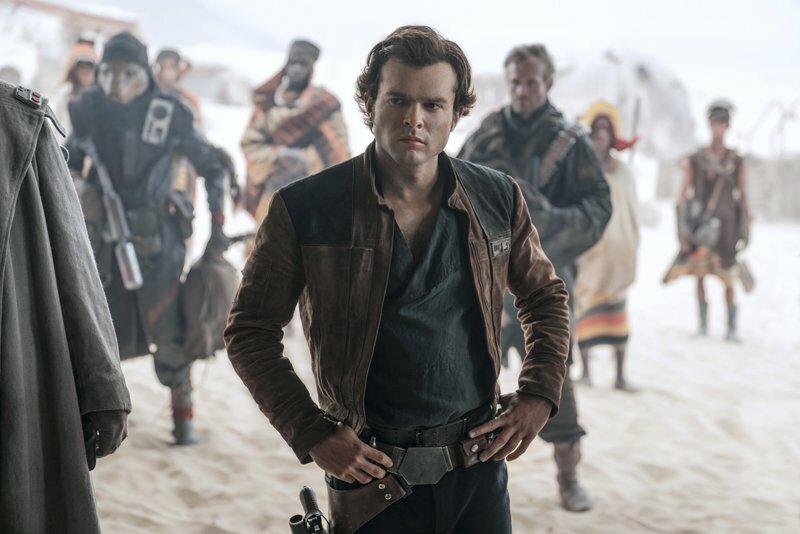 No matter how much money it makes opening weekend or overall, or even how well critics review the film, Solo is a monumental success for all parties. It’s truly an incredible feature of story-telling that holds every bit of classic Star Wars within it’s veins. It’s a non-stop, original story that will keep you on the edge of your seat with the purest fun and entertainment possible. While Rogue One and The Last Jedi gave us that dark and gritty story-telling we’ve been yearning for in this franchise, Solo is able to capture the essence of Star Wars, those moments that made us fall in love with this crazy idea all those years ago. As I mentioned above, this is one of the most constant movies I’ve seen recently. It’s pacing is incredible, and the good kind. We’re spoiled, as we’re treated to speeder chases, high-stake robberies, insanely beautiful space action sequences, and twists and turns that will have you giddy like a little kid in a candy shop through its entire run. It scream classic Star Wars, and although that entertainment value alone is worth going to the nearest theater immediately, it’s the characters, their relationships and the performances that drive this film. Of course, the film and it’s overall idea comes down to Alden Ehrenreich and his performance as Han Solo. Last year, we all heard the rumblings that Ehrenreich was struggling, an acting coach was involved and that Disney and Lucasfilm were possible second guessing their decision. Well, those rumblings were all complete false as Ehrenreich is one of the best parts of the film. From his mannerisms, personality and Solo-esque one-liners, he 100% nails the character in this specific time era. Remember, this isn’t the Solo of Episode IV, this is 10 years earlier. His younger, immature, more reckless than ever, and Ehrenreich nails it perfectly while also bringing his own flair. That flair is no doubt credited to Ehrenreich, but his performance couldn’t have been without the impeccable writing of franchise legend Lawrence Kasdan and his son Jon. Kasdan has been with the Kasdan has been with the franchise since The Empire Strikes Back and has always said Solo is his favorite character to write. After this movie, it’s clear as to why. The dialogue, the moments, the nostalgia. I can’t count how many times I was laughing or cheering because of the moments that were unmistakably Han Solo. You know it’s something worth praising when we’re forgetting about Harrison Ford’s Solo for just a short time and loving what we’re seeing on screen. Outside of Han, the relationship he builds with supporting characters is as strong as ever. Starting with Qi’ra, her presence was felt just as much in the movie, and that’s all due to the amazing Emilia Clarke. This woman can do no wrong, and it’s absolutely brilliant that she’s now part of Solo’s story, and if a sequel happens, will continue to be. She wasn’t just a great love interest, but a capable badass who showed more times than one that she can handle anything on her own. Her story is quite interesting as well. Although I found myself wanting to learn more about her time after her separation with Han at the beginning of the film, I also found myself quite happy with the twists and turns that came with the character. Her decisions and motivations may be iffy due to the fact that she’s kept is such a big shroud of mystery, but it’ll hopefully be a big pay-off if her story does continue in a hopeful sequel. Both Donald Glover and Woody Harrelson bring some very strong performances to the table, too. Glover’s Lando was the highlight of every marketing piece to the film’s lead-up, and I think it’s safe to say it was a success. His charm and swag, if you will, is unlike anything in the galaxy. Glover captures the Lando we all know and love, but with the younger cockiness that the character should have. As for Harrelson’s Tobias Beckett, he was the best new addition this film could’ve offered. While he isn’t as flashy as Lando, as interested as Qi’ra or lovable as Chewbacca, he’s the most important to the character of Solo. The film’s opening offered our first ever look at where Han grew up, alone. Beckett offered a security blanket for the character, a father figure if you will. In such a short period of time, Beckett taught Han everything we know about him. You may have your squabbles with Harrelson, but it’s hard to argue against his presence in this story. And then there’s everyones favorite walking carpet, the ever so de-aging Chewie. He’s being a staple to the franchise from the very beginning, but Solo gives the character the widest range yet. He’s an absolute stud, and the way director Ron Howard was also able to weave in his and Han’s origin was absolutely fantastic. Their origin and instant relationship is my favorite part of the film. The back-and-forth is unlike anything we’ve seen from the characters. It makes for some very fun moments on screen. I can go on all day about all the amazing things this movie did, but not every movie is perfect. While I echoey the hell out of everything above, there are a few minor things that held the movie back from being great to phenomenal. Dryden Vos is a very interesting character, especially his anger problem. But with the film’s pacing and the fact that Vos is only working for someone worse (aka freaking Darth Maul! ), we didn’t get to fully dive into the character. We got glimpses, but it wasn’t enough to really ever care about him or what he was doing. It’s also hard to argue against those who complain about how Han had no real arc in the movie. From the moment we first saw him get into the speeder on Correlia to those closing moments on the Falcon, he was the same guy. The events in the film didn’t change who he was, as he is the same wise-cracking outlaw with good intentions all the way from the opening of this film to his final moments on Starkiller Base in The Force Awakens. The most important part of all of this is that I walked out of that theater not just wanting to see it again, but wanting more stories with these characters. I was part of that group of fans that was hesitant towards the idea of this film when first announced. I didn’t like how the studio behind our beloved Star Wars wasn’t expanding the galaxy and continuing to focus on characters we already know. I still feel that way, but boy am I glad we got this movie. 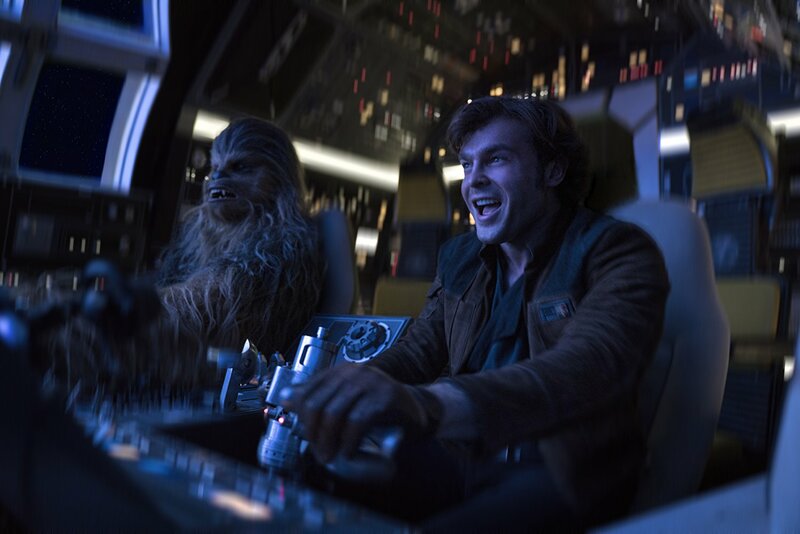 I want to see more of young Han and Chewie, trying to take on the galaxy by themselves. 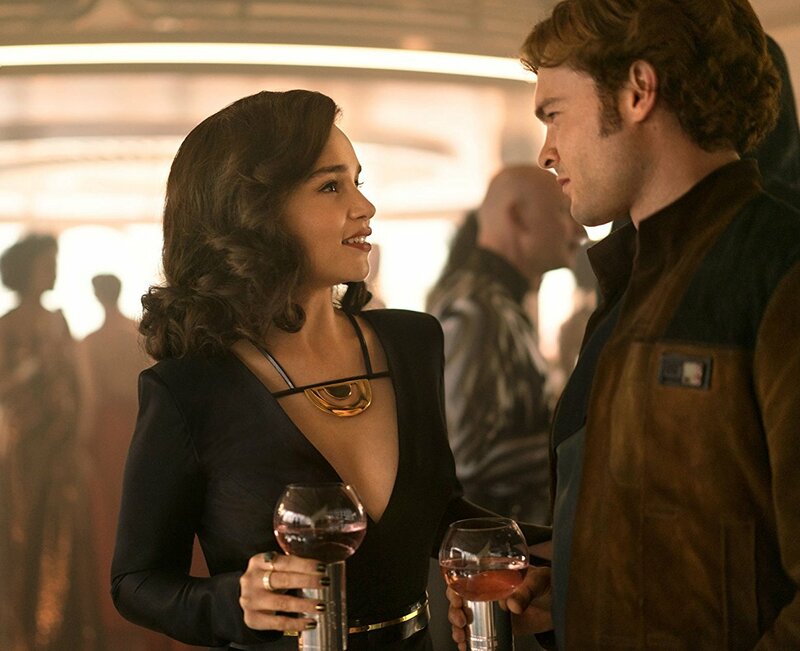 I was to see the resolve between Han and Qi’ra, and especially more of that cocky back-and-forth between Ehrenreich’s Han and Glover’s Lando. Does it have its problems? Sure, every film does. But the pros far outweigh the cons in this case. Characters, action and most importantly fun. I don’t remember the last time I had this much fun and was this entertained through the entire run of a two plus hour film. It’s mind-blowing, in the best ways possible. 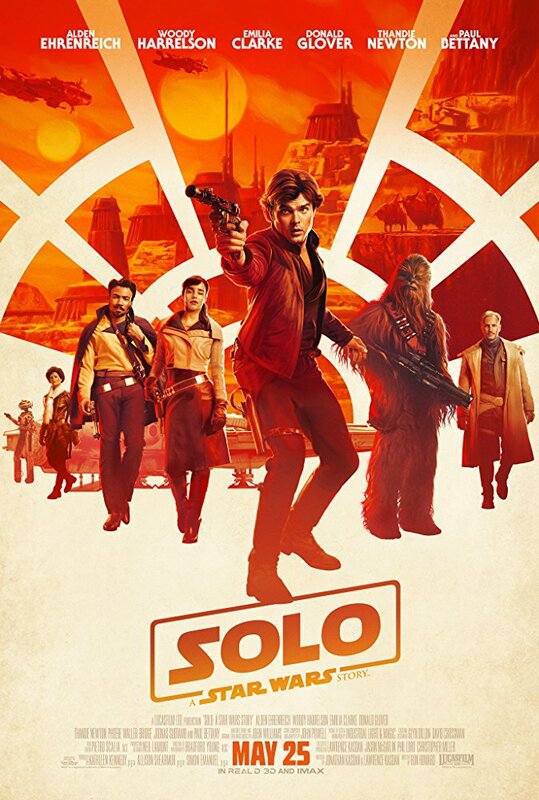 In a time where the Star Wars fandom is torn on where the beloved franchise is headed, Solo brought hope (ah, see what I did there) back into our eyes that Star Wars, over everything, reaches a level of adventure that no other titles can. And if that isn’t enough of a reason to get behind the thoughts and ideas of the studio, then I don’t know what is. Rating: 9 out of 10 unrefined coaxium pieces. This is an excellent review that hits upon the fun and phenomenal aspects of the film. Thank you for the comment & liking to it! I’ll defintely head to the link & check it out!